Project Connect handed out about 200 of these flyers over the weekend. But they didn't show what they claimed. 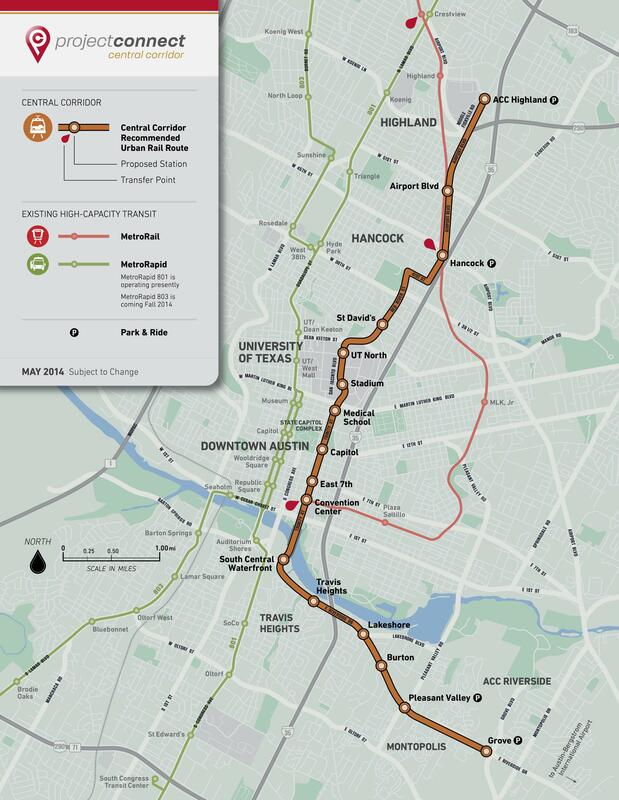 This map shows the most recent proposed first line of urban rail from Project Connect. This, in fact, is the most recent map of the proposed rail line from Project Connect (left). The overall map of the long-term vision handed out over the weekend titled "Proposed First Line of Urban Rail" doesn’t even show the latest iteration of that first line, which goes to Highland Mall. So why not use the most recent rail map for the proposed first line, instead of an outdated map of Project Connect’s overall vision? “Well, the proposed first line of the urban rail definitely fits into the Project Connect system,” says Capital Metro communications specialist John Julitz, who works on Project Connect. Julitz says the public is curious to know how the proposed first line of urban rail would fit into the larger system envisioned by Project Connect, so they used an existing map of their overall vision that has been out for over a year, but titled it "Proposed First Line of Urban Rail." But the talking points and guidance given to those canvassers say nothing about the proposed first line, or how it would integrate into something bigger. It focuses instead on gauging locals knowledge of Project Connect, and encouraging them to attend their open houses that will be held across town in the coming weeks, listed on the back of the flyer. Read those talking points here. “It was unfortunate that they [Project Connect] were distributing a map that was completely misleading,” says Scott Morris. Morris heads the Central Austin Community Development Corporation, a group focused on public safety and bridging the interests of students and residents in the neighborhood. The map Project Connect was using shows transportation options not under consideration at this time, Morris says, like rail to the airport and to the Mueller Development. He fears Project Connect may have been trying to mislead residents in Central Austin into thinking that the proposed first line of urban rail would go down Guadalupe and North Lamar streets (which he and representatives of other neighborhood and student groups support) instead of along Red River Street and Airport Boulevard (which they do not). Project Connect's Julitz downplayed Morris’ concerns about the flyer, saying they’re just the allegations of “one guy who’s upset that we’re not going down Guadalupe and Lamar” with the proposed first line of urban rail. “I think if it’s their intention to inform the public and seek input on the current rail alignment, then they need to do so with accurate information,” Morris says, “not information that’s going to confuse, and in the case of our [Hyde Park] community, add to the level of anger that’s already present." The Urban Transportation Commission will meet tonight at City Hall to get an update on the Project Connect rail proposal. The Austin City Council is expected to call for a funding vote on urban rail in August. Update: Project Connect quickly put together a new flyer (below). They say those who received the original inaccurate map will get a copy of this new flyer. This updated flyer was quickly put together by Project Connect after controversy over an inaccurate map passed out to Hyde Park residents.